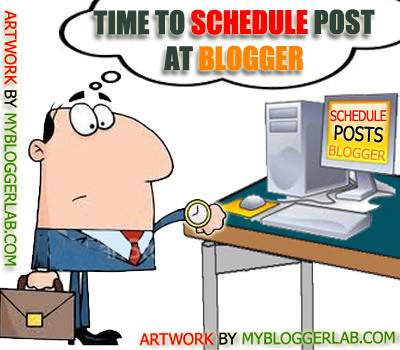 If you are using Blogger Blogspot to blog, and you are wondering about the method to schedule your future posts. Especially when you are out for holidays or during exams, you don’t want to open your computer to just press a Publish Now button,that seems pretty annoying! So if you still believe that there is not way to schedule your post then you would be surprise to hear that Blogger has this feature from 2008. And today we will learn How We Can Schedule our Post. So let us get started. Timing matters, Not only for SEO (Search Engine optimization) but also for your Alexa Ranking.It is crucial that every day you publish your posts at accurate timing. This not only improves your Alexa Ranking but also has some significance in SEO. 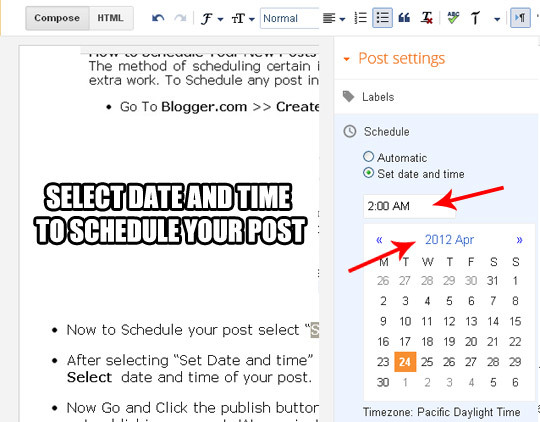 And Blogger Scheduling feature allows you to do that,you can easily plan timing of your future posts by scheduling them. You can use this feature to schedule your post when you are busy in your exams or any other occasion. And on the other hand publishing your post at accurate timing allows the crawling bots to crawl the most out of your blog. 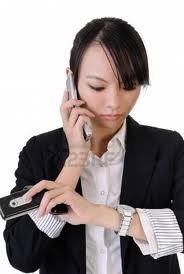 The method of scheduling certain is pretty simple you don’t need to do any extra work. 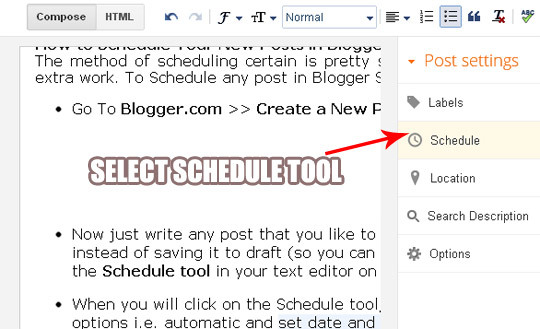 To Schedule any post in Blogger Simply Follow the steps. Now just write any post that you like to publish. After writing your post instead of saving it to draft (so you can publisher it later) just click on the Schedule tool in your text editor on the right side of your screen. When you will click on the Schedule tool, you will be able to see two options i.e. automatic and set date and time. Now Go and Click the publish button (Don’t worry by doing this we are not publishing our post. We are just scheduling it). After you click the publish button all the work is done. Now you will be able to see a tag attached to your post (Scheduled) which means you have schedule your post for automatic publishing. 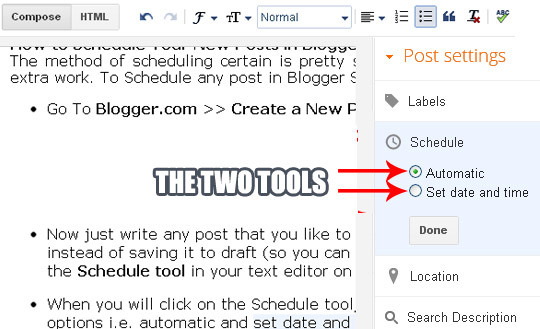 If you want to un schedule your posts in blogger just follow the same steps as we did previously in scheduling. Done your post is now un scheduled. You can now revert it to draft or you can even publish it. You can do whatever you like. Its the most simplest but most useful tool of blogger. But it has some bugs for example, if we schedule our post and then we go to edit it again and we did some changes in our post. But then we thought that there is no need of editing and without saving it you just closed the window ignoring the warning of browser (You have unsaved changes will be loss? are you Sure). In that case your post will be reverted to draft. So its important to keep in our mind that only schedule a post which is ready for publish. So, guys that's how you can Schedule or Un Schedule your Post in Blogger.So that's it for now buddies, if you have any difficulties feel free to ask. So now what are you waiting for? just go and start scheduling till then Peace, Blessings and Happy Scheduling. First Of all Thanks For Liking The Artwork. And Creating These Cartoons Pics Are really Simple any one can create these Awesome Cartoons. Soon We will Start A Series on ClipArt Designing For Blogging. Which Will Allow You To Design Much Better Cartoon Then Me :)...So Stay tuned. Peace Pal. Too bad the Scheduled Posts feature has been broken for a week...thousands of posts online about this. Yes, It is facing lots of Problems But You can use Windows Live Writer.As currently it is the only way to Schedule your post Correctly From Blogger. I'm really frustrated with the scheduling feature not working at the moment. What is Windows Live Writer and how can I use that to schedule posts? It is always a good exercise to keep a ready made posts in draft, it can be scheduled in emergency.